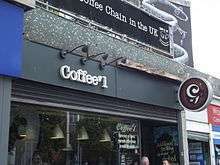 Coffee#1 is a British coffee house chain that originated in Cardiff, Wales in 2001. Since 2011 it has been owned by Cardiff brewery company SA Brain. Coffee#1 now has outlets across Wales and southern England. Coffee#1 started in 2001 with the opening a coffee shop on Wood Street, Cardiff, by entrepreneur James Shapland. By 2011 it had 15 outlets across South Wales and South West England and had twice won the Cafe Society's Coffee Bar Chain of the Year award. In the autumn of 2011, Coffee#1 was bought by the Cardiff brewery company SA Brain, who wished to diversify from their successful pub business. The move was seen as a symptom of the tough trading conditions in the beer market. Brains had previously had Costa Coffee outlets in several of its pubs. In 2013 another nine outlets were added and in 2014 sales grew by 55%. In April 2015 the company opened their 50th outlet, in Fareham, Hampshire, giving them a total workforce of 380. At the end of 2015 the chain included 57 coffee shops across Wales and parts of southern and central England. It planned to open another 15 in 2016. 1 2 Chris Kelsey (26 November 2015). "Coffee #1 to open 15 new shops across Wales and England as part of £85m package". Wales Online. Retrieved 2015-01-10. 1 2 Sion Barry (25 March 2015). "Coffee#1 is star performer in strong financial results from SA Brain & Co". Wales Online. Retrieved 2015-01-10. 1 2 "Brains brewery plans to open 30 Coffee #1 shops". BBC News. 23 May 2012. Retrieved 2015-01-10. 1 2 Chris Kelsey (4 October 2011). "SA Brains buys Coffee#1 chain". Wales Online. Retrieved 2015-01-10. ↑ "Brains brewery Coffee #1 shops sales rise 55%". BBC News. 8 May 2014. Retrieved 2015-01-10.